The conception of God in Judaism is strictly monotheistic. God is an absolute one, indivisible and incomparable being who is the ultimate cause of all existence. Jewish tradition teaches that the true aspect of God is incomprehensible and unknowable, and that it is only God's revealed aspect that brought the universe into existence, and interacts with mankind and the world. 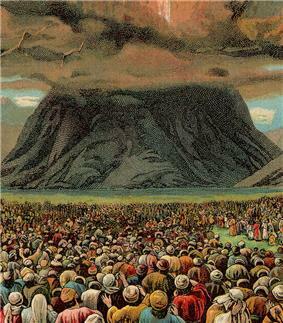 In Judaism, the one God of Israel is the God of Abraham, Isaac, and Jacob, who is the guide of the world, delivered Israel from slavery in Egypt, and gave them the 613 Mitzvot at Mount Sinai as described in the Torah. The God of Israel has a proper name, written YHWH (Hebrew: יְהֹוָה, Modern Yehovah Tiberian Yəhōwāh) in the Hebrew Bible. The name YHWH is a combination of the future, present, and past tense of the verb "howa" (Hebrew: הוה‎) meaning "to be" and translated literally means "The self-existent One". A further explanation of the name was given to Moses when YHWH stated Eheye Asher Eheye (Hebrew: אהיה אשר אהיה‎) "I will be that I will be", the name relates to God as God truly is, God's revealed essence, which transcends the universe. It also represents God's compassion towards the world. In Jewish tradition another name of God is Elohim, relating to the interaction between God and the universe, God as manifest in the physical world, it designates the justice of God, and means "the One who is the totality of powers, forces and causes in the universe". YHWH (יהוה) is known as the Tetragrammaton—literally, "the four letters". Jews traditionally do not pronounce it, and instead refer to God as HaShem, literally "the Name". In prayer this name is substituted with Adonai, meaning "Master" or "Lord". Many scholars have suggested that the vocalization as Hebrew: יְהֹוָה, Modern Yehovah Tiberian Yəhōwāh combines the consonants YHWH with the vowels of "Adonai" as a commemorative mark to prevent the reader from pronouncing the proper name of God (YHWH), which is forbidden for any Jew in times after the destruction of the Jerusalem Temple. Therefore the mispronunciation as Yəhōwāh really is a hybrid form of notation, most likely developed in the High Middle Ages by Masoretic scholars. It is suggested that it may have existed in magical traditions outside Judaism, in Late Antiquity. "Godhead" is the English-language term which in Judaism is sometimes used to refer to "God-as-God-is-in-Godself". In the philosophy of Maimonides and other Jewish-rationalistic philosophers, there is little which can be predicated about the "Godhead" other than its "existence", and even this can only be asserted equivocally. In Jewish mystical thought (Kabbalah), the term "Godhead" usually refers to the concept of Ein Sof (אין סוף), which is the aspect of God that lies beyond the emanations (sefirot). The "knowability" of the Godhead in Kabbalistic thought is no better that what is conceived by rationalist thinkers. As Jacobs (1973) puts it, "Of God as God is in Godself—Ein Sof—nothing can be said at all, and no thought can reach there". Judaism is based on a strict monotheism. This doctrine expresses the belief in one indivisible God. The worship of multiple gods (polytheism) and the concept of a Singular God having multiple persons (as in the doctrine of Trinity) are equally unimaginable in Judaism. The statement par excellence in terms of defining God is the Shema Yisrael, originally appearing in the Hebrew Bible: "Hear O Israel, the Lord is our God, the Lord is One", also translated as "Hear O Israel, the Lord is our God, the Lord is unique/alone". God is conceived of as eternal, the creator of the universe, and the source of morality. God has the power to intervene in the world. The term God thus corresponds to an actual ontological reality, and is not merely a projection of the human psyche. Maimonides describes God in this fashion: "The foundation of all foundations and the pillar of wisdom is to know that there is a Primary Being who brought into being all existence. All the beings of the heavens, the earth, and what is between them came into existence only from the truth of His being." Since all of existence emanates from God, whose ultimate existence is not dependent on anything else, some Jewish sages perceived God as interpenetrating the universe, which itself has been thought to be a manifestation of God's existence. In this way Judaism can be regarded as similar to being panentheistic, while always affirming genuine monotheism. The Hebrew Bible and classical rabbinic literature affirm theism and reject deism. However, in the writings of medieval Jewish philosophers such as Ibn Daud and Gersonides, perhaps influenced by neo-Aristotelian philosophy, one finds what can be termed limited omniscience. The idea of God as a duality or trinity is heretical in Judaism - it is considered akin to polytheism. "[God], the Cause of all, is one. This does not mean one as in one of series, nor one like a species (which encompasses many individuals), nor one as in an object that is made up of many elements, nor as a single simple object that is infinitely divisible. Rather, God is a unity unlike any other possible unity". This is referred to in the Torah: "Hear Israel, the Lord is our God, the Lord is One". While Jews hold that trinitarian conceptions of God are incorrect, there is a minority view which holds that non-Jews who maintain such beliefs are not held culpable. 'Why did Sarah laugh, and say "Shall I indeed bear a child now that I am old?" Is anything too hard for the Lord?'" Most rabbinic works also present God as having the properties of omnipotence, omniscience and omnibenevolence. This is still the primary way that most Orthodox and many non-Orthodox Jews view God. Most of classical Judaism views God as personal, meaning that humans have a relationship with God and vice versa. Much of the midrash, and many prayers in the siddur portrays God as caring about humanity in much the same way that humans care about God. Harold Kushner, a Conservative rabbi, writes that "God shows God's love for us by reaching down to bridge the immense gap between God and us. God shows God's love for us by inviting us to enter into a Covenant (brit) with God, and by sharing with us God's Torah." "Gaze at the heavens and see, and view the skies, which are higher than you. If you sinned, how do you harm God, and if your transgressions are many, what do you do to God? If you are righteous, what do you give God? Or what does God take from your hand? Your wickedness [affects] a person like yourself, and your righteousness a child of humanity." Any belief that an intermediary between humanity and God could be used, whether necessary or even optional, has traditionally been considered heretical. Maimonides writes that "God is the only one we may serve and praise....We may not act in this way toward anything beneath God, whether it be an angel, a star, or one of the elements.....There are no intermediaries between us and God. All our prayers should be directed towards God; nothing else should even be considered." Some rabbinic authorities disagreed with this view. Notably, Nachmanides was of the opinion that it is permitted to ask the angels to beseech God on our behalf. This argument manifests notably in the Selichot prayer called "Machnisay Rachamim", a request to the angels to intercede with God. 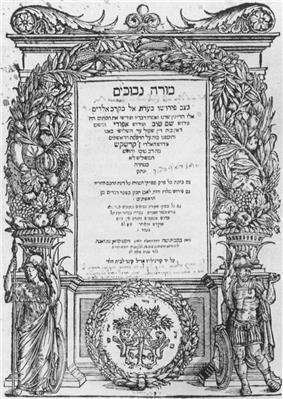 Modern printed editions of the Selichot include this prayer. God is non-physical, non-corporeal, and eternal. A corollary belief is that God is utterly unlike man, and can in no way be considered anthropomorphic, as stated in Maimonides' Thirteen Principles of Faith. All statements in the Hebrew Bible and in rabbinic literature which use anthropomorphism are held to be linguistic conceits or metaphors, as it would otherwise have been impossible to talk about God at all. According to Orthodox Judaism, the seven names for God over which scribes must exercise particular care, and which one is not allowed to erase a letter are: YHWH, El, Eloah, Elohim, Elohay, Shaddai, Tzeva'ot. No consensus has been reached by academics on the origins of monotheism in ancient Israel, but Yahweh "clearly came out of the world of the gods of the Ancient Near East." ^ See Gersonides "Views on omniscience"